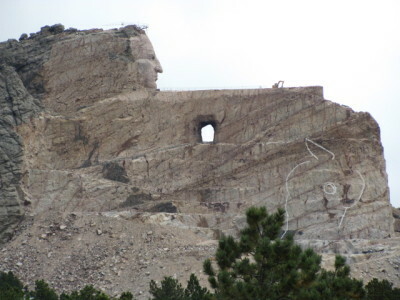 Using Rapid City SD as our base camp, today we explored more of the Black Hills, concentrating on the Crazy Horse Memorial, a gigantic sculpture, unfinished, of the great Sioux chieftain. 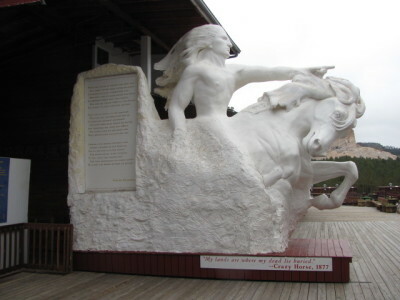 In 1948 Korczak Ziolkowski was commissioned to sculpt a statue that could serve as a tribute to all Native Americans. When completed it will be the world’s largest statue, a total of 563 feet tall by 641 feet long. 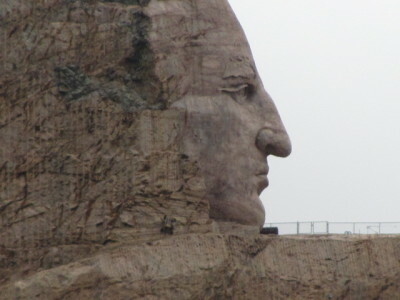 The chief’s head is over 87 feet tall. We began our visit with an excellent, moving video describing Korczak’s work and the spirit of the undertaking. The sculptor died in 1982 but his work was continued by his wife and seven of their ten children. Amazing! Then we strolled through the museum and out to the observation deck which contains a 1/34 scale model of the completed statue. We were especially touched by the dedication of the sculptor and his family to this lifelong project and also by the fact that they refused government funding and involvement, preferring to finance the sculpture through public visits and purchases on the grounds. We had planned to visit Mount Rushmore while in the area, but because of the government shutdown and the fact that we were there before, we decided to skip this American icon. Because an impending snow storm (would you believe on October 3rd? ), we decided to cancel our second night in Rapid City and to head east, hopefully ahead of the storm, to Mitchell, South Dakota. As a result we were forced to squeeze a number of last minute stops into the morning. 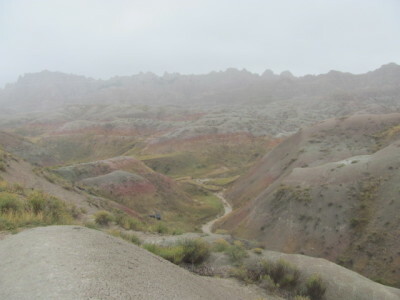 Next, we decided to try to see some of Badlands National Park, even though the government shutdown has shuttered all US national parks. 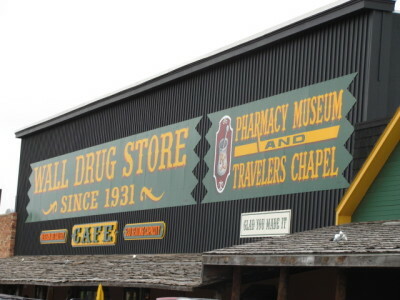 We thought maybe we would be able to enter since state route 240 passes through the park. 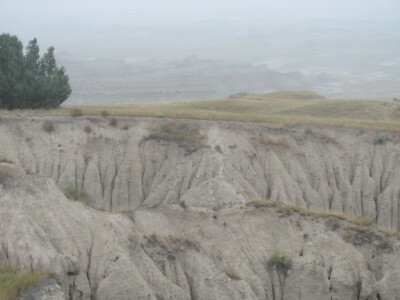 Luckily we were right, and although the weather turned foggy and drizzly, we were able to take a number of photos of the beautiful and eerie landscapes. 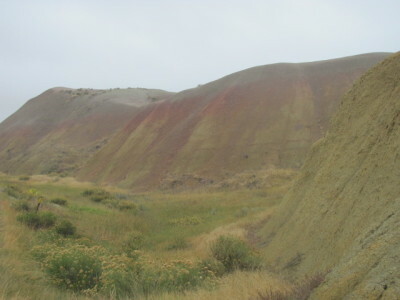 For instance, there are sections where unusual rock formations parade before your eyes. 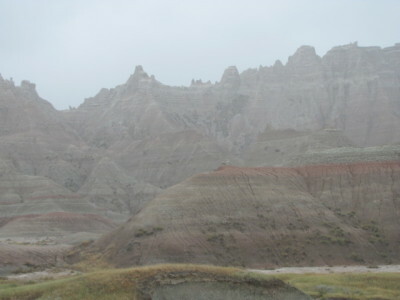 Other areas showed the typical striated sandstone of badlands. Some of the colors were striking and different. Because of the fog, the vistas are probably not as spectacular, however, one can certainly get the idea that this place is special. 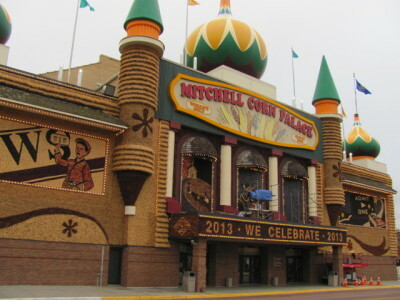 We finished our day in Mitchell, South Dakota, home of the famous Corn Palace, one of America’s most cherished roadside attractions.